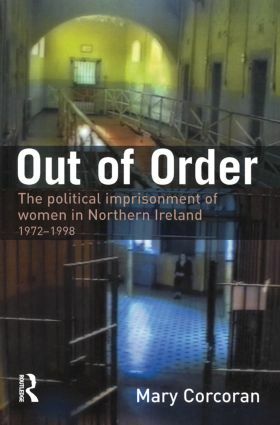 This book provides a comprehensive account of the imprisonment of women for politically motivated offences in Northern Ireland between 1972 and 1999. Women political prisoners were engaged in a campaign to obtain formal recognition as political prisoners, and then to retain this status after it was revoked. Their lengthy involvement in a prison conflict of international significance was notable as much because of its longevity as the radical aspects of their prison protests, which included hunger strikes, dirty-protests and campaigns against institutional abuses. Out of Order brings out the qualitatively distinctive character and punitive ethos of regimes of political imprisonment for women, exploring the dynamics of their internal organisation, the ways in which they subverted order and security in prison, and their strategies of resistance and exploitation. Drawing upon a wide range of first hand accounts and interviews this book brings together perspectives from the areas of political imprisonment, the penal punishment of women and the question of agency and resistance in prison to create a unique, highly readable study of a neglected subject.